Back at it again with a look for less review! You can see my last look for less review of the popular Marc Fisher Espadrille Wedges here and the lace-up cognac sandals here. 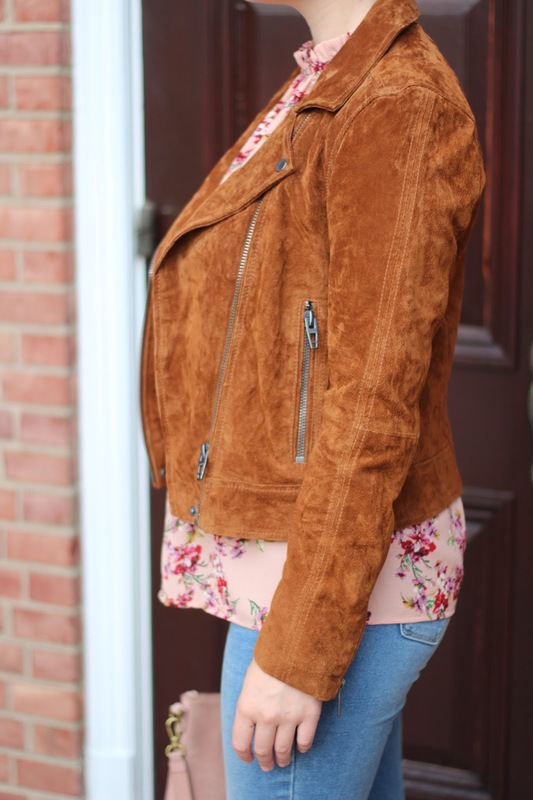 This time around I am sharing a blogger favorite, the BLANKNYC Suede Moto Jacket versus a much cheaper Old Navy Suede-Knit Moto Jacket that is a 3rd of the price! 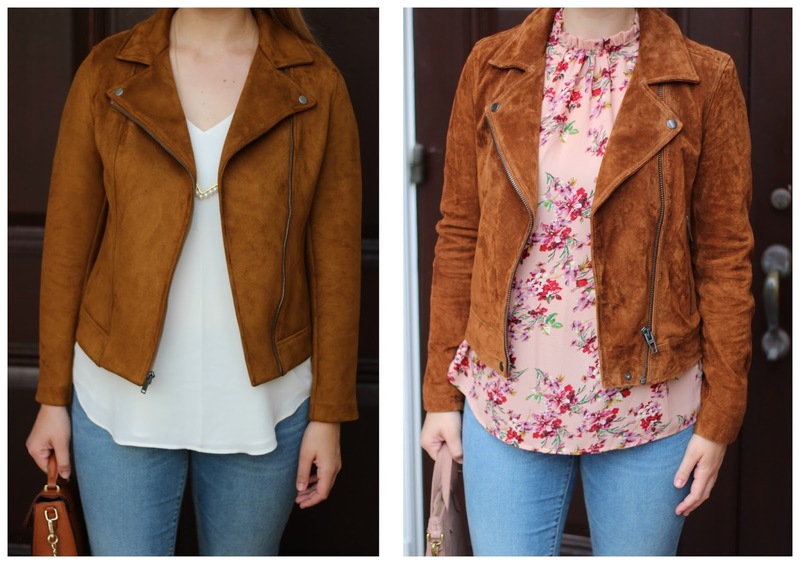 Both I have bought and tried out to give an in-depth review of these two almost identical suede jackets at two different price points. This style has been around for the past couple of seasons and will most likely be sticking around. For more inspiration on how to style them click here. FIT: I bought a medium in this jacket and it fits perfect! It still has room in the arms to add a light sweater underneath which is something I wanted. I am a size 6 so this jacket runs true to size according to the size chart. 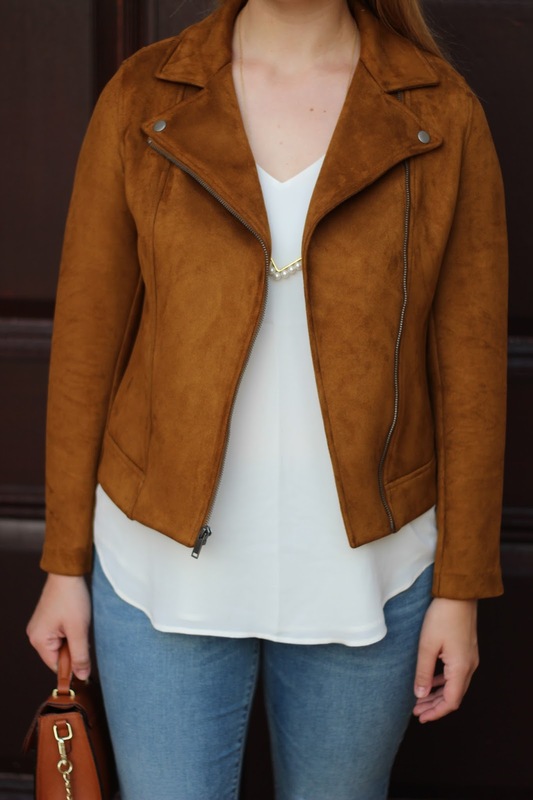 COMFORT: This jacket is very comfortable, it doesn't feel extremely heavy and for a suede jacket that is awesome! 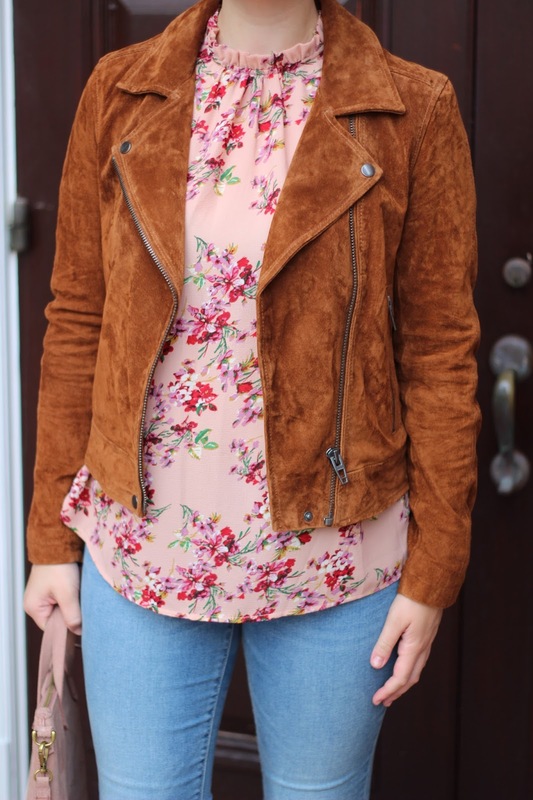 I really wanted a jacket that I would throw on over anything (similar to a jean jacket in the summer if that makes sense) for the Fall and Winter. QUALITY: I would say the quality is amazing for the price. It feels like it could be $1000+ which is awesome because I did not spend anywhere near that. This is a classic staple that I will wear for many years to come, it was made very well. PRICE: So I bought this during the Nordstrom Anniversary Sale for around $125, I have to say, even if it wasn't on sale I would have still paid full price. Like I mentioned above, it is more expensive than I like to spend on things, but the quality is amazing and will hold up for many years to come. So if you can't splurge on it right now, I highly recommend saving up and getting this jacket. 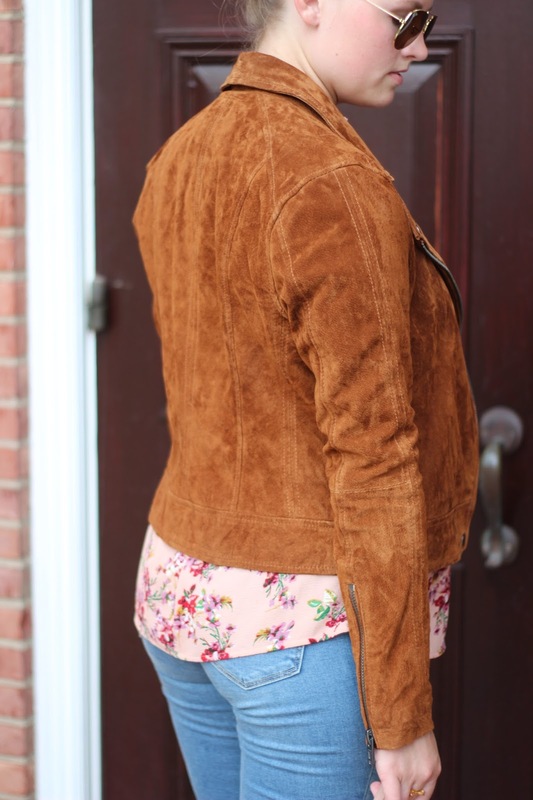 OVERALL THOUGHTS: I would highly recommend this jacket and in multiple colors! Cognac is a staple in my closet especially in the Fall and that is when I plan to wear it the most. 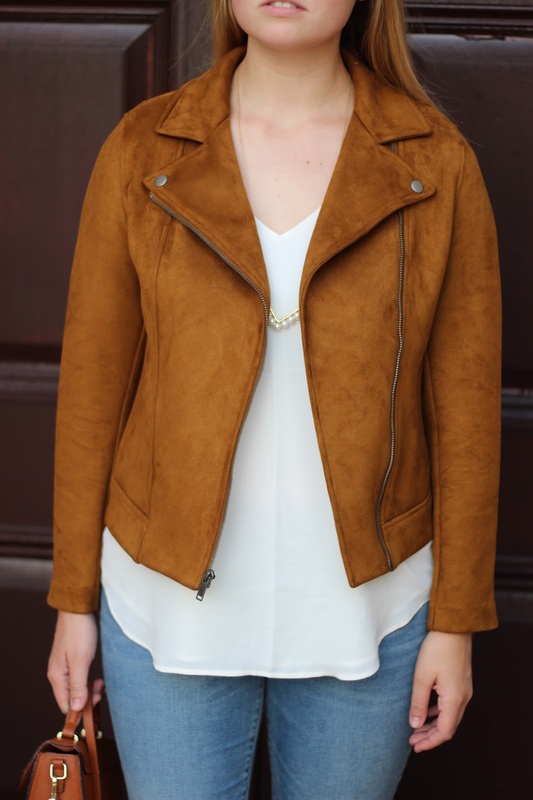 The quality meets the higher price, and the price is still low compared to designer suede moto jackets that will cost you an arm and a leg. This is a piece you will have in your closet years to come that will match with anything and everything! FIT: I bought this in a size small and maybe could have done a xs so the sleeves would be tighter. The small everywhere else fits perfectly so this too runs true to size, especially for the brand. If you have smaller arms or are petite I would recommend trying a size down. COMFORT: This jacket is very comfortable and not stiff at all. It is actually a super stretch material so I can see it working really well with chunky sweaters. I can raise my arms above my head in this jacket and the material is very flexible. QUALITY: The quality isn't the best, but for the price, they are pretty good. It looks almost identical to the BLANKNYC one listed above except you can tell the material is different. I think depending on how much you wear it, it will last the year, but probably not much longer. You will have to try it out in store for yourself to figure out if the cheaper quality of the jacket is worth it. PRICE: So the price is pretty good already, I thought originally it was a little high for a jacket that wasn't that high in quality. I just waited till they had a 40% off sale and got my jacket for $35! That to me is worth the price for a jacket like this. So yes the price is cheap, but so is the jacket so just be careful about that. OVERALL THOUGHTS: This is a great option if you don't think you will be wearing often. For the price, I don't feel guilty about spending the money and I also don't feel like I need to wear them all the time to get my money worth. If that sounds like you, I would pick this option up. 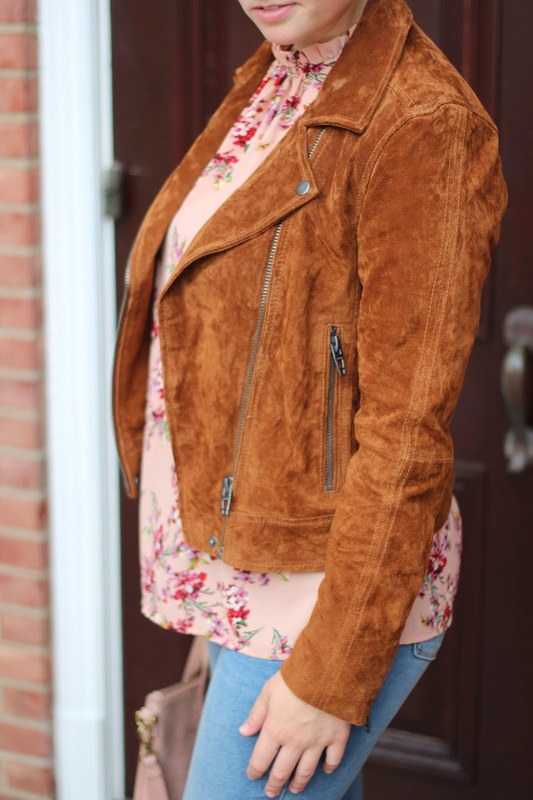 If you feel like you are going to wear the heck out of a jacket this season and years to come, go with the more expensive option above. I decided to pick up the same jacket in the burgundy/wine color jacket too! Just as a heads up, this jacket keeps selling out, but they keep restocking it online. Check your local store to see if they have it for you! This is such a good idea! I love the comparision between the two! Totally wanting that BlankNYC jacket! I can't believe the Old Navy version is only $60! I do however, prefer the richness of the cognac color on the Blank NYC version the most. I am a cognac fanatic and love how it looks on me! I have to agree with you. I think this is one of those jackets that would get a lot of use for years to come, and totally worth the slightly higher price! I think they both look awesome but agree that if you're going to be wearing it a lot, invest in the Blank NYC one! Both options look really good, I'm loving how you styled the top one with the floral shirt- cute combo! Love both of those! I have to say I'm a fan of the splurge here, but I do own it! I love them both actually! Wow, they are quite comparable! 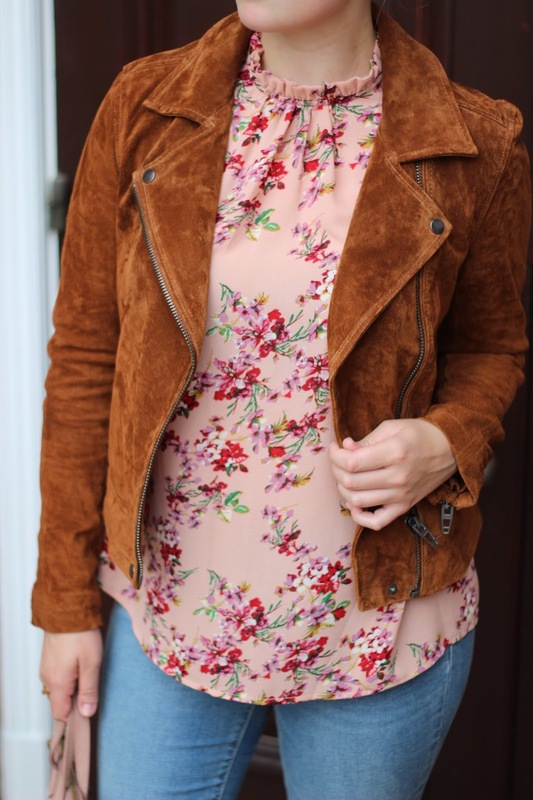 Love the combination of the floral top with the suede moto! Looking so fantastic and ready for fall! i love this series of yours!! such comparable looks! and yes, i agree. investing in a piece that will be your fall go-to is always worth it! So funny that you chose to review a BLANKNYC jacket because I had just been looking at one and was asking myself all these questions that you just answered! Most likely will go ahead and buy it, like you said totally worth it sometimes!